Disclaimer: This post contains affiliate links. If you click a link and make online purchases from any of the featured sites, we receive a small commission that allows us to keep this site operational. Looking to purchase a firearm? Start reloading your own rounds? We’ve rounded up some great deals available for a limited time. At Sinclair International, get $50 off the Hornady Lock-N-Load Classic Reloading kit AND 500 free bullets (retail value of $94.05 to $177.60) by mail-in rebate. Sign up for Sportsman’s Guide Buyer’s Club and save an additional 5% on already low prices on guns and ammo and 10% on all other purchases. Walther P22 Semi-Automatic .22LR MSRP $449 Sale price $302.99, $287.84 with buyers club discount. 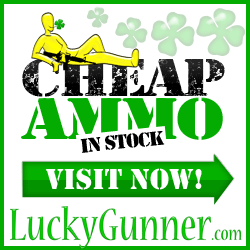 Lucky Gunner has .45ACP for under 33 cents a round. More great prices are available on all rounds. Brownells has Wilson Combat 1911 8-Round magazines on sale for a solid price. Gander Mountain is having its biggest firearms sale of the year. Lots of manufacturers and models to choose from. Check out their Red Tag Event. Looking for a deal on a Firearms or accessory purchase? Let us know what you’re looking for in the comments and we’ll try to round up a great deal for you soon!